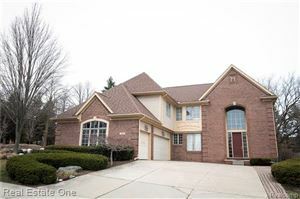 Beautiful brick Ranch you've been waiting for in Rochester! This home boasts 1953 sf with an additional 1924 sf in the fully finished basement. Plenty of working space in the kitchen, open floor plan concept flows with wood floors, oak cabinets, ss appl, pantry, lg island. Grand style GR w/cathedral ceiling, windows w/amazing views & gas FP. Fully remodeled Mbath, Euro shower door, granite vanity & ceramic tile floor & shower, Lg WIC. 1stFL laundry convenience. 2 car garage w/extra attic storage. Nook w/patio doors leading to lg Trex & cedar deck overlooking the private yard which is surrounded by trees & backs to commons area. Daylight Bsmt w/plenty of extras incl built-in FP w/remote, theatre rm w/projector, speakers, Fitness rm incl TV, safe/steel closet, sep work area, rec lighting, 4th BR w/WIC, bar w/granite, bar fridge & stools. Bsmt plumbed for bath. Meticulously clean home! HOA incl pool tennis streetlights, commons maintenance.